If West Ham United had hoped for a favour from a team with far less to play for, they were looking in the wrong place. 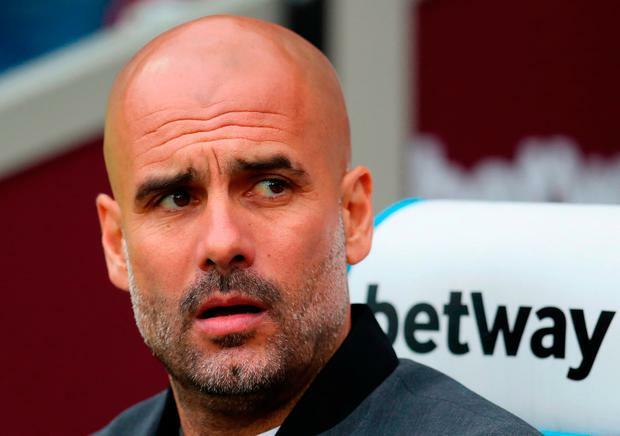 Pep Guardiola wants Manchester City to prove that they are "the best team in English history" by smashing the Premier League record points total. Yesterday's facile victory moved them on to 93 points, one win away from breaking Chelsea's 95-point record, set in 2004-05. City still have three games left - against Huddersfield, Brighton and Southampton - and are aiming to break the 100-point record. What's more, they are only one goal behind Chelsea's Premier League goals record of 103, set in 2009-10, and Guardiola wants them to seal their legacy by putting themselves in the history books. "I'm happy that next Sunday we will receive the Premier League (trophy)," he said, "and (have) the chance to be the best team in all the history in England, the most points. "The numbers we are going to achieve, once will be broken. But it will not be easy. They will have to play good to break the records we are going to break." Guardiola said that his players are not just motivated by numbers now, but also by the simply enjoyment of playing football. "First of all, they like to play football - they are professionals," he said. "And that is the most important thing. It's a job, but they are amateurs in terms of how they enjoy training and playing." Guardiola is motivated by improvement and he knows there is much more to come from this team. "Football is not a finished business, never, never," he said. "We can be more clinical in front of goal. "The last five, 10 minutes of the first half was not good After 65 minutes we were not hungry enough to attack and score another one. "Individual mistakes. Our full-backs did not control the players inside. If I feel we cannot do better, no sense, it's already done. Football is never finished. Always you can do something good." 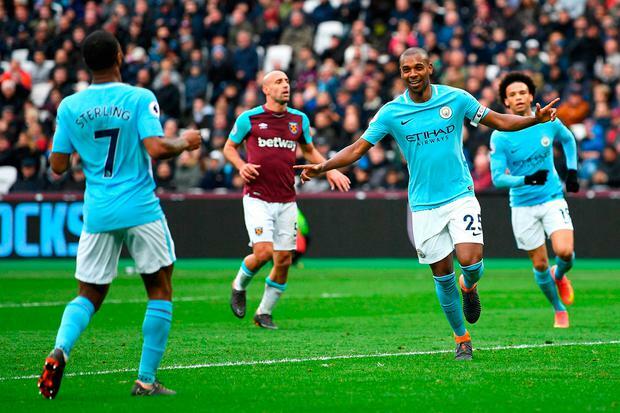 West Ham were unable to offer and real resistance to City's ambitions and now find themselves just three points ahead of third-bottom Southampton. It would take an unlikely combination of results to send them down, but they are not fully safe, not yet. And they did not offer many reasons for confidence here; no team should ever concede as many chances as this. For 40 minutes this was a fairly low-key demonstration of the reasons why City won the title long before we got into May. They were not at their relentless best, but they did not need to be. They still monopolised possession, played entirely in West Ham's half and did not allow their hosts much more than a desperate hack out of defence every few minutes. Even when City's execution was not perfect - there was no David Silva here - their learned patterns were too much for West Ham to stop. It was always so easy for Kevin de Bruyne, Kyle Walker or anyone else to pop up in space and create a chance - even up against David Moyes' belt and braces 5-4-1. 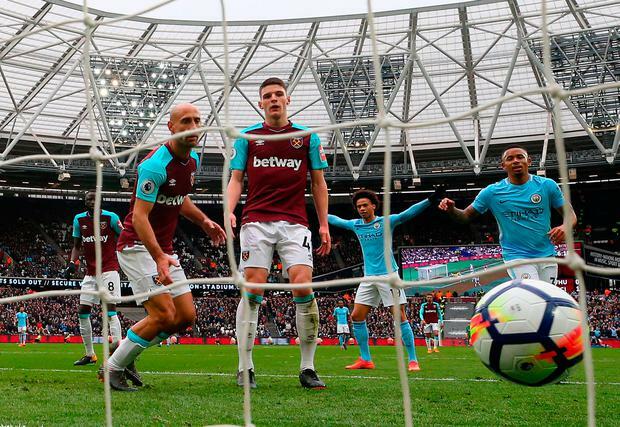 As West Ham got squeezed further and further back into their own box, it was no surprise at all when the first goal came. Ilkay Gundogan to Raheem Sterling to Leroy Sane, cutting in from the right, and his left-footed 25-yarder deflected in off the head of West Ham defender Patrice Evra. The second goal was an even clearer example of brilliant build-up, clumsy execution. After Sterling nearly scored running in behind, Gundogan found De Bruyne out on the right. He whipped in a low cross which bounced off Adrian, Declan Rice and Pablo Zabaleta before trickling in. When Marko Arnautovic flattened Ederson, the home crowd woke up and City briefly dropped their guard. 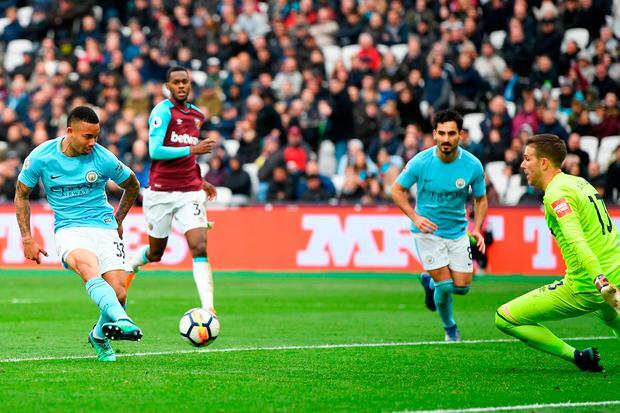 Gundogan tripped Edimilson Fernandes and Aaron Cresswell curled a free-kick over the wall and past Ederson, in at the near post. 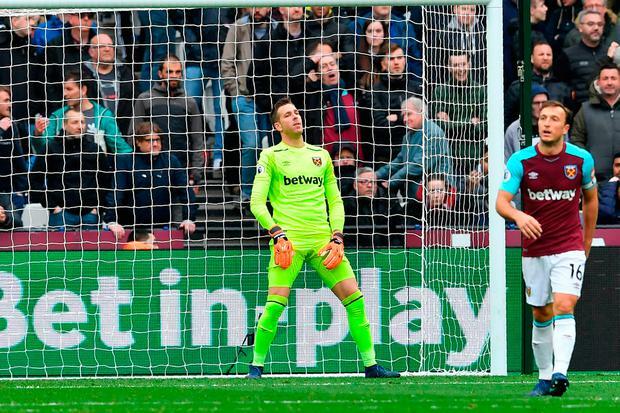 City looked so embarrassed to have let West Ham back into the game that they came out for the second half with that relentlessness they have at their best. The most surprising part of the afternoon was that City scored only two more in a second half that was so one-sided it made the first half look like an even contest. Every few minutes Sterling was sprung in behind Evra and both of City's goals came from his runs into that channel. First, Jesus picked Sterling out with a De Bruyne-level pass. The Brazilian raced forward to accept the return pass and skipped past Zabaleta before producing an immaculate finish.